Czech Physicist Dr. Lubos Motl: "Well, the actual history of CO2 followed Scenario A most closely – the CO2 emissions kept on rising at a slightly accelerating rate. So you can see that Hansen predicted the warming trend about 3°C per century. The actual observed trend from the 1980s (well, early 1980s) has been about 1.3°C per century according to satellite and slightly below 2°C per century according to weather stations. Although we didn't really stop CO2 emissions at all, the temperature was growing almost exactly like Hansen's scenario in which the CO2 concentration becomes constant after 1988!" "There's nothing "worse" about the climate of 2018 relatively to the climate of 1988." Tomorrow, it will have been exactly 30 years from the day (June 23rd, 1988) when James Hansen gave a testimony before the U.S. Senate. For the first time, the American politicians were told by a “mainstream looking” active scientist that the global warming would kill us unless we dramatically change our industries and society. The Real Climate – well, Gavin Schmidt – reminds us about the anniversary. A part of the Hansen 1988 package was this paper, Global Climate Changes as Forecast by [GISS 3D] model. Note that in 1988, it was fashionable to use the plural for “climate changes”. Incidentally, this is still the convention in Czech – and I guess in other languages. In English, for some reason, a single “climate change” became much more popular. The singular form was probably supported by some leftist organizations promoting Gaia and its unity – or the unity of all nations in the world. It probably sounds more impressive when a single important thing (“the climate”) is changing then if you admit that there are just mostly random changes of thousands of quantities that are really separate from each other. Here, Scenario A was meant to be business-as-usual in which the CO2 emissions kept on increasingly at a very slightly accelerating rate. Scenario B assumed some slowdown of the emissions. Scenario C assumed that we would stop emitting CO2 immediately. Well, the actual history of CO2 followed Scenario A most closely – the CO2 emissions kept on rising at a slightly accelerating rate. So you can see that Hansen predicted the warming trend about 3°C per century. The actual observed trend from the 1980s (well, early 1980s) has been about 1.3°C per century according to satellite and slightly below 2°C per century according to weather stations. Although we didn’t really stop CO2 emissions at all, the temperature was growing almost exactly like Hansen’s scenario in which the CO2 concentration becomes constant after 1988! To say the least, Hansen overstated the warming trend by a factor of two or so (perhaps between 1.5 and 2.5, depending on which observational data you build upon). The evolution of the concentrations of N2O was between the “immediate halt” and “lower emissions”, despite the fact that no policies against this gas have really been enacted. 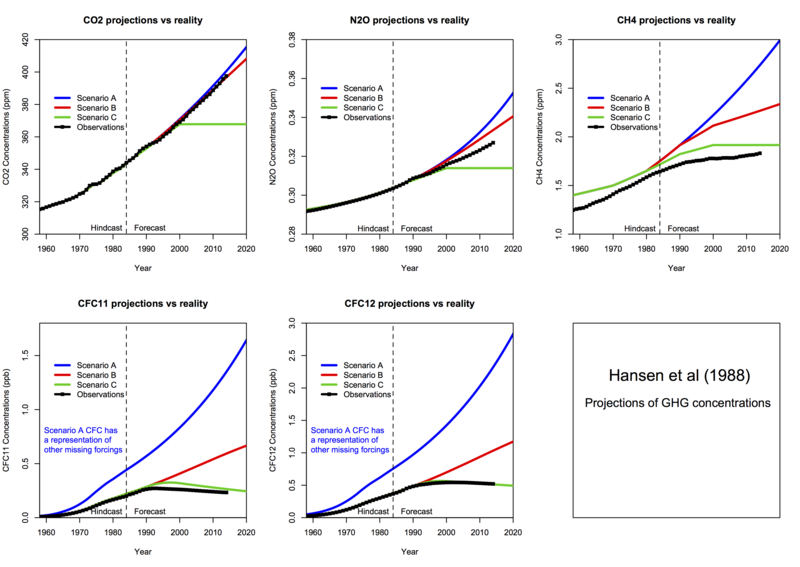 Hansen’s false predictions are even clearer in the case of CH4. He predicted a fast growth in the absence of effective policies. But even though no one has really adopted policies that would effectively discourage CH4 emissions, the CH4 concentration basically stopped growing. And so did CFC11 and CFC12, some complicated greenhouse gases. When it comes to the concentrations and temperature changes, Hansen overstated the problem by a factor of two. It’s a big inaccuracy but you could say it isn’t completely game-changing. But his contribution was important because he has also pioneered the hysterical discourse when it comes to the hypothetical “detailed additional consequences” of the “climate changes”. There have been virtually none – but he was predicting many. I am talking about the frequency of wildfires, hurricanes, torrential rains, droughts, and all these unwelcome events. Nothing has really become worse about them at all. I think that the temperature change isn’t really the core of the propaganda – the real-world temperature is changing by amounts that are approaching one degree in the recent century and they’re only predicting twice or thrice that amount. It’s primarily the additional, “less physically calculable” impacts where they’re really lying. Their predictions of those changes are either completely wrong or overstated by at least an order of magnitude. James Hansen remained a radical activist – who hasn’t hesitated to be arrested. In his new book, Hansen criticizes Barack Obama and other leftists as losers. They could have enacted something insane and effective, like a global carbon tax, but they did nothing and James Hansen despises them. Some temperature change has taken place but I think that 30 years after Hansen’s testimony, all sensible people may see that the idea that “something bad was gonna happen to the climate within our lifetimes” seems utterly implausible. There’s nothing “worse” about the climate of 2018 relatively to the climate of 1988. We’re 30 years older – some of us weren’t around in 1988 – but the climate is doing fine and vegetation and ecosystems are arguably much healthier than in the late 1980s. 1988 was the year of the peaking advanced socialism in my country. I remember insane emissions at that time, dirty cities, dust, carcinogenic emissions, acid rains etc. Those should have been reduced and they were reduced within less than a decade dramatically. But a problem with CO2? Not really. Incidentally, soda and beer makers are just facing shortage of CO2 that they need to add to their beverages. That’s quite ironic in a world where lots of people claim that CO2 is basically a poison.